Men's Cubavera and St. Barts white, brown, blue and natural stone color long pants and walking shorts are available. St. Barts linen and rayon blend pants are recommended. They match up with the many white shirts for casual wear and white beach weddings. MauiShirts offers: Guayabera style white shirts, white wedding linen shirts, embroidered and panel shirts. 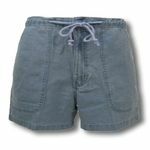 St. Barts, Weekender pants and shorts, HIC Walk shorts, Hook & Tackle, River Guide and Trader shorts. Silk Paradise Found walking shorts.